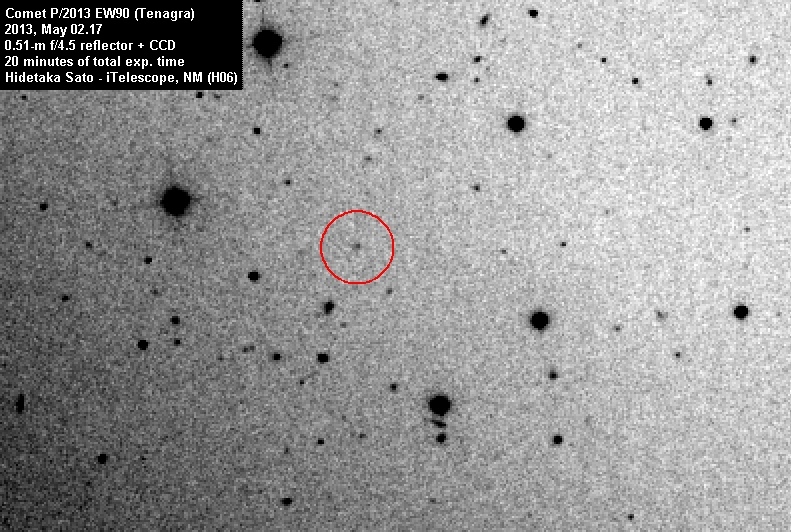 2013 EW90 was discovered by the Tenagra survey (located near Nogales, AZ, U.S.A.) on images taken by M. Schwartz and P. R. Holvorcem with a 0.41-m f/3.75 reflector on 2013, Mar. 3. Its Tj parameter is 2.75, so it was a good T3 candidate. 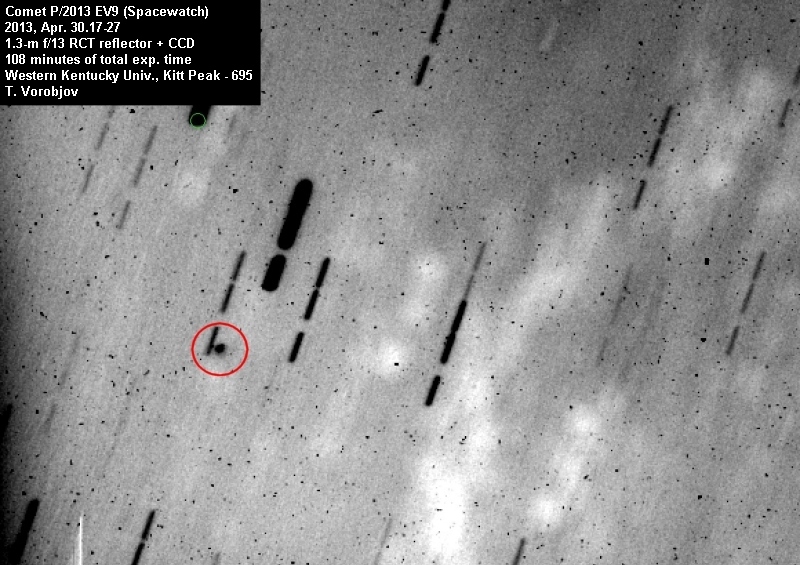 Hidetaka Sato remotely observed it on 2013 Apr. 30.15 using a 0.51-m f/4.5 reflector from iTelescope, Mayhill (MPC H06), finding a softer aspect respect to stars (FWHM 4.3″ vs 3.3″) and a coma up to 18″ wide on a stack of 10 x 60 seconds images. He observed it again on May 02.17 with the same telescope/site, finding a 12″ coma on a stack of 6 x 120 seconds images, and FWHM of 5.1″ respect to 3.4″ of stars. Following his alert to the T3 mailing-list, I asked for some confirmations, which came as following. L. Buzzi, on behalf of the IASC team (P. Miller, P. Roche, A. Tripp, R. Miles, R. Holmes, S. Foglia, L. Buzzi, T. Vorobjov, T. Lister) obtained 6 x 180 seconds images on May. 03.42-43 in good seeing with the 2.0-m f/10 Faulkes Telescope North from Haleakala. All the images were stacked and measured by himself and S. Foglia, finding a clear cometary aspect, with a diffuse coma at least 5″ wide. 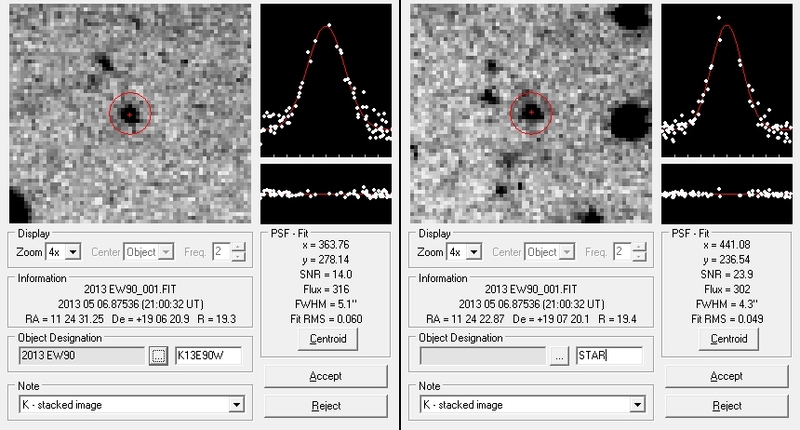 L. Buzzi obtained two night of observations from Schiaparelli Observatory (MPC 204) with a 0.60-m f/4.64 reflector. On the first night (May. 04.90-92) a stack of images totalling 43 minutes of exposure time, 2013 EW90 appears clearly softer respect to stars, with a FWHM about 25% larger and a round 11-12″ coma. On the second night (May. 06.85-89) a stack of images totalling 48 minutes of exposure time in slightly better seeing, the object appears again softer respect to stars, with a FWHM 15-20% larger than stars nearby and a 9″ coma with no tail. T. Lister, Las Cumbres Observatory Global Telescope Network, obtained 9 x 300 seconds images with the 1.0-m f/8 Ritchey-Chretien from LCOGT Node at McDonald Observatory. 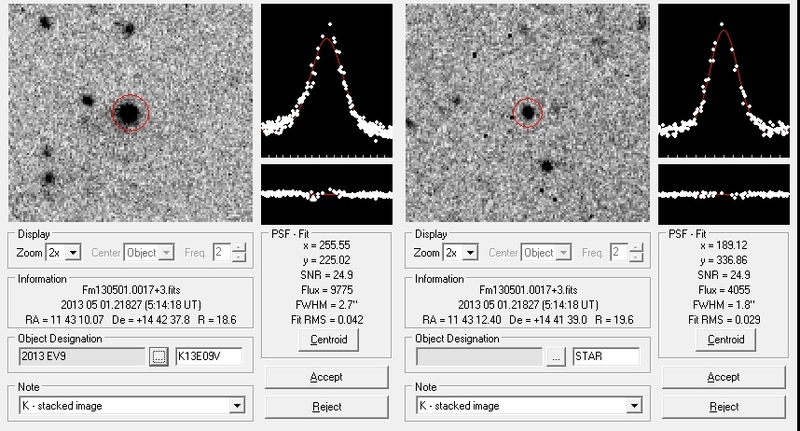 All the images were stacked and measured by L. Buzzi, S. Foglia and himself, finding a FWHM more than double respect to stars (3.2″ vs 1.4″) and a 5″ coma. CBAT released CBET 3522 (subscription required) on May 13; all the observations can be found on MPEC 2013-J52. 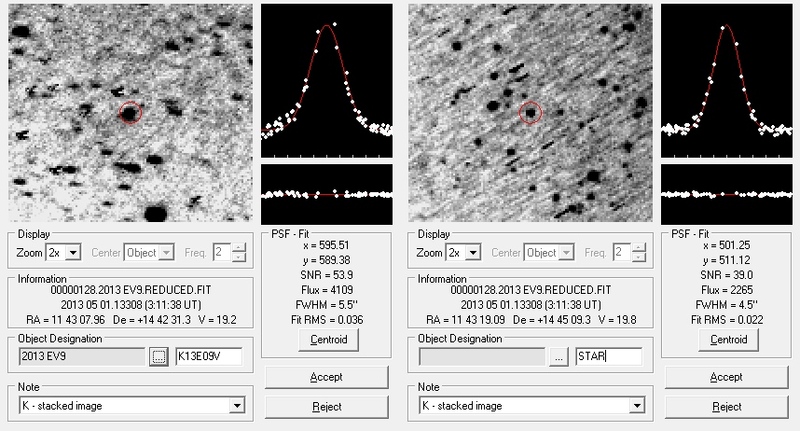 2013 EV9 was discovered by the Spacewatch survey on images taken by T. H. Bressi with the Spacewatch 0.90-m f/3 reflector (+ CCD mosaic) on 2013, Mar. 2. Its Tj parameter is 2.77, so it was a good T3 candidate. 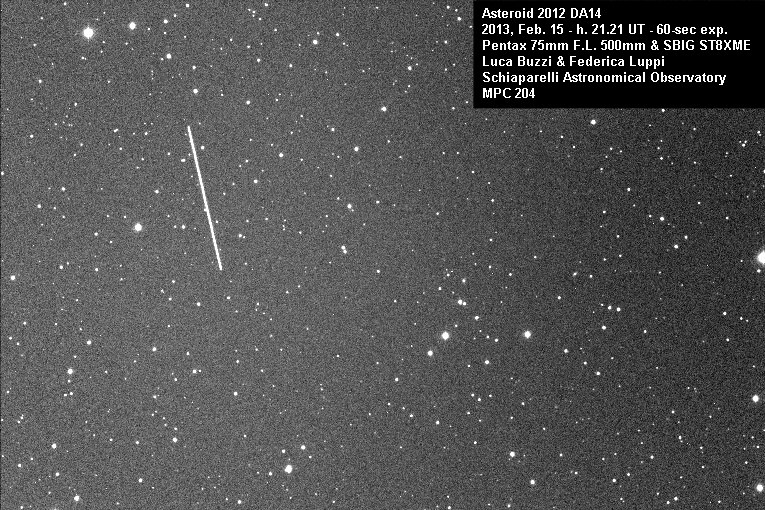 Hidetaka Sato remotely observed it on 2013 Apr. 28.42 using a 0.51-m f/4.5 reflector from iTelescope, Siding Spring (MPC Q62), finding a softer aspect respect to stars (FWHM 4.8″ vs 3.6″-3.8″) and a small coma on a stack of 10 x 60 seconds images. On the following night (Apr. 29.16) he observed it again remotely with the same instrumentation but located near Mayhill (MPC H06), finding the FWHM to be 4.0″ respect to 3.3″ for the stars, with a compact coma 6-8″ wide in a stack of 10 x 60 seconds. Following his alert to the T3 mailing-list, I asked for some confirmations, which came as following. Tomas Vorobjov observed it on two nights (Apr. 29.17-21 and Apr. 30.17-27) using the 1.3-m f/13 Western Kentucky University reflector at Kitt Peak. On the first night, stacking 18 x 120 seconds images, he found a coma 5″ across and a hint of tail in PA 120 degrees. On the second night, a stack of 54 x 120 seconds reveals a coma 5″ x 5″ and a tail 15″ long in PA 120 degrees. 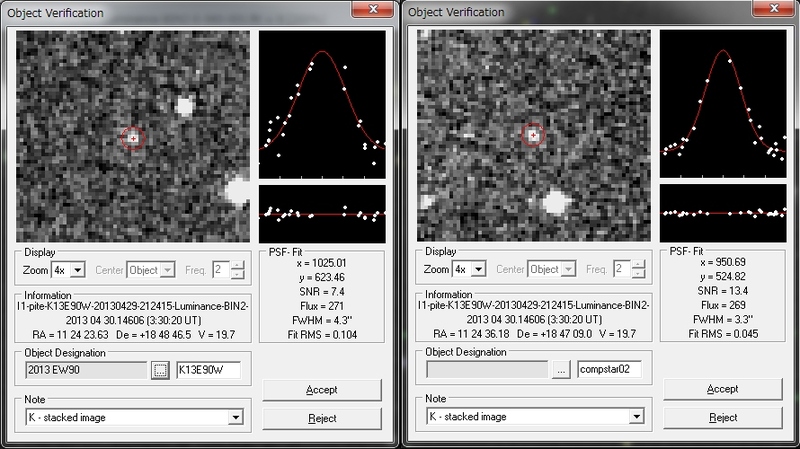 Bill Ryan, Magdalena Ridge Observatory, obtained a set of images with the 2.4-m f/8.9 reflector on May 01.21. 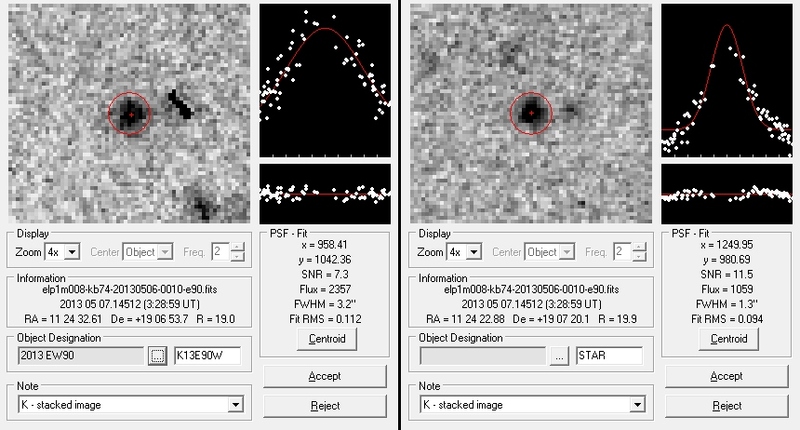 A stack of 4 x 60 seconds images measured by L. Buzzi, S. Foglia and himself shows a FWHM 50% larger than stars nearby (2.8″ vs 1.8″) with a coma 10″ wide, clearly extended to the south-east. 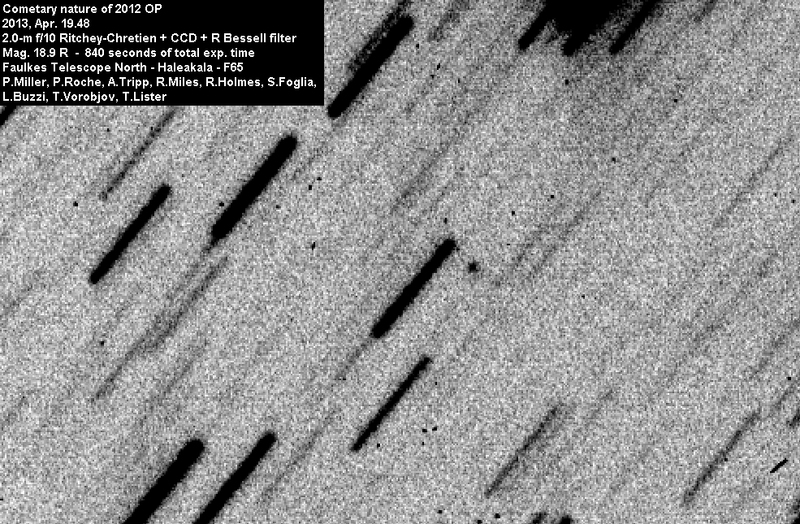 A stack of 31 x 75 seconds images obtained on May 01.12-14 by R. Holmes, Astronomical Research Institute, with a 0.76-m f/4 astrograph, and measured by L. Buzzi, S. Foglia and T. Vorobjov shows clearly a softer aspect respect to stars, with a 15″ coma elongated to the south-east. Americo Watkins obtained remotely a set of images with the Mt.Lemmon 0.81-m f/7 reflector as part of the Sierra Stars Observatory Network, on Apr. 30.13-14. A stack of 8 x 60 seconds images measured by himself and L. Buzzi shows a 6″ x 5″ coma extended to the east. CBAT released CBET 3503 (subscription required) on May 2; all the observations can be found on MPEC 2013-J10. 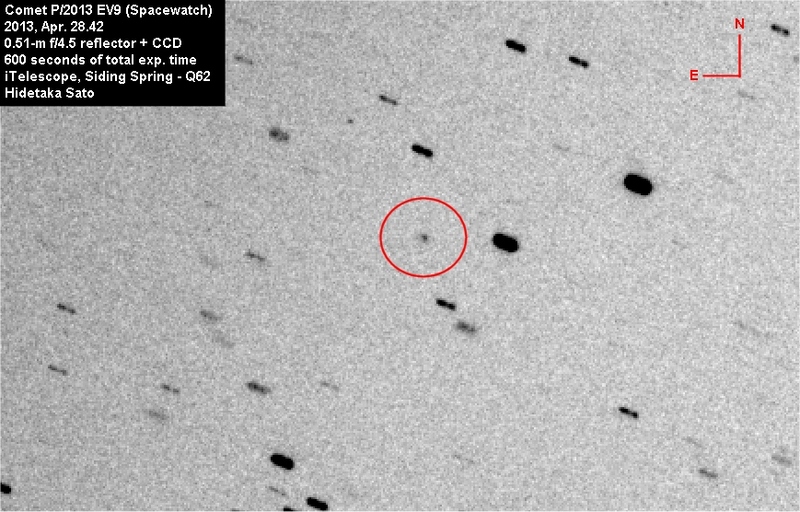 2012 OP was originally discovered as a minor planet by R.H. McNaught using the Uppsala 0.5-m Schmidt from Siding Spring Survey on 2012 Jul. 16.62, when it was at mag. 20V. It was also a T3 candidate because of is Tj parameter (-0.98). 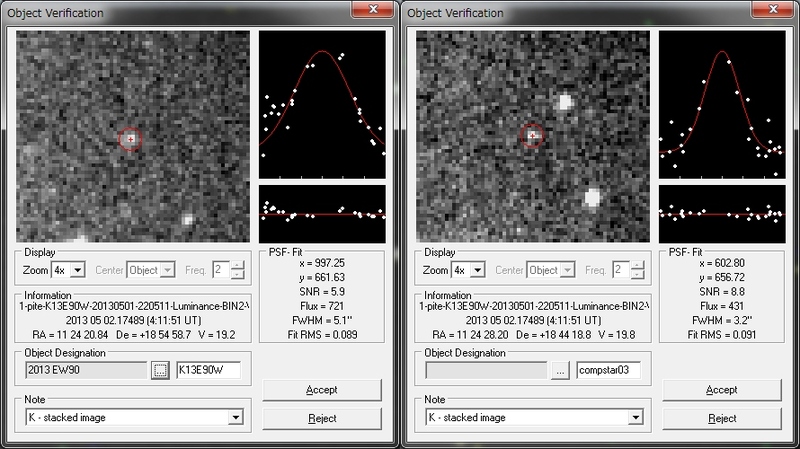 It was observed by other southern observatories for 2 months, then it was “lost” in the solar conjunction (2012 Dec. 4). It was recovered by Hidetaka Sato on 2013, Mar. 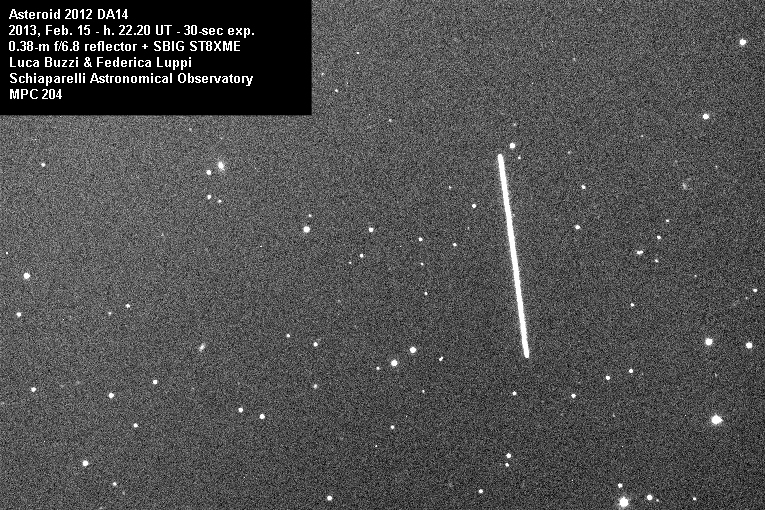 20 using remotely a 0.51-m f/6.8 reflector from iTelescope Observatory, Siding Spring (MPC Q62), then it was observed again by himself on Apr. 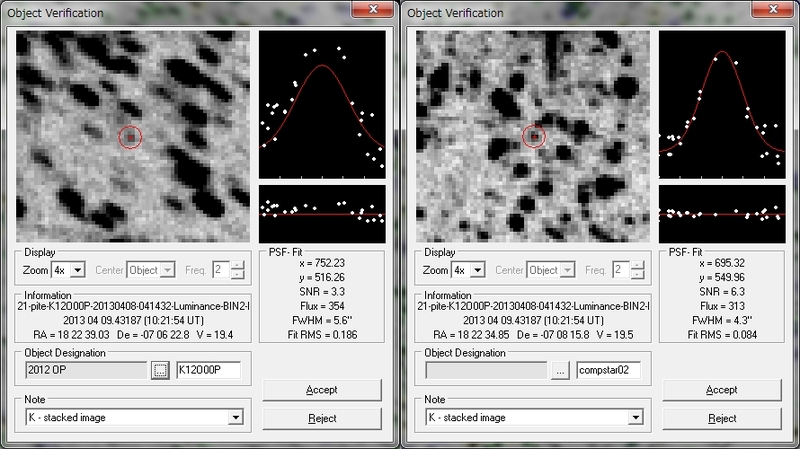 9 and 11 remotely from iTelescope Observatory, Mayhill (MPC H06) with the same instrumentation. 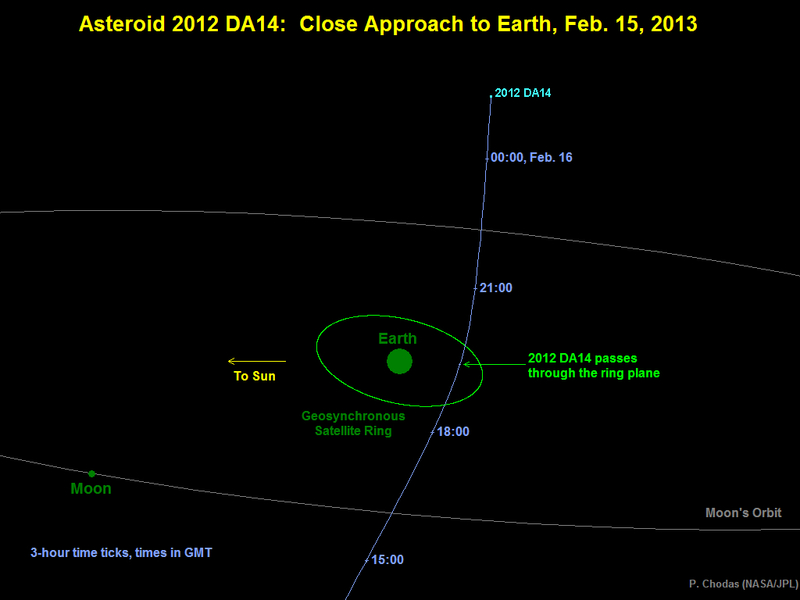 In the meantime, Minor Planet Center issued 2012 OP recovery with MPEC 2013-H12 on Apr. 17. On behalf of a larger collaboration I have with IASC team (composed of P. Miller, P. Roche, A. Tripp, R. Miles, R. Holmes, S. Foglia, T. Vorobjov, T. Lister, E. Gomez and myself) I managed to observe it on Apr. 19.48-49 with the 2.0-m f/10 Faulkes Telescope North: a stack of 14×60 seconds images reveals a softer aspect respect to stars, with a coma at least 4″ wide possibly elongated toward the west. I then alerted both Tim Lister from LCOGT and Bill Ryan from Magdalena Ridge Observatory. A stack of images taken by Tim with one of their 1.0-m f/8 telescopes from Cerro Tololo (MPC W85) revelaed a clear larger profile respect to stars (2.1″ vs 1.5″), but the definitive evidence came from the terrific images taken by Bill with the MRO 2.4-m f/8.9 reflector. Even in single images a coma and a tail was visible, and a stack of 10×60 seconds images shows a strong central condensation with a 10″ coma and a broad tail 20″ long centered in PA about 250°. CBAT then issued CBET 3486 (subscription required), though not including all the people involved, on Apr. 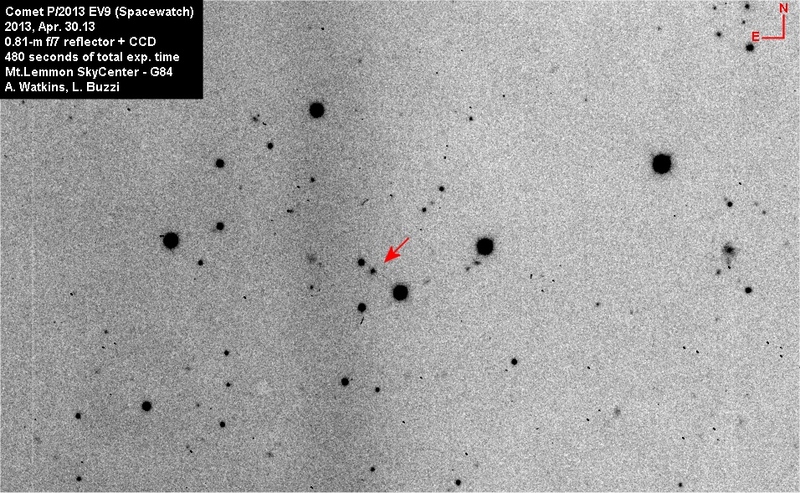 23 with the discovery of the cometary nature of this unusual minor planet, again a proof of how fruitful a pro-am collaboration can be. 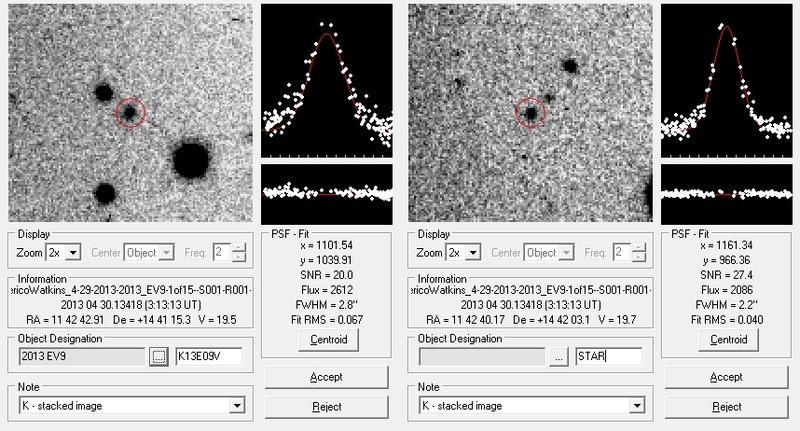 All the astrometry from the discovery until now can be seen on MPEC 2013-H36. 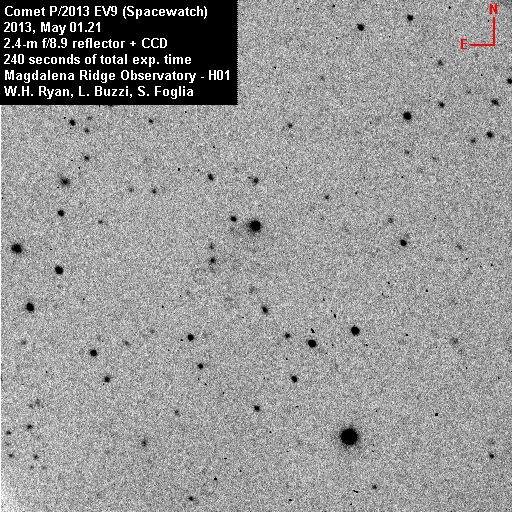 (the definitve confirmation images from Magdalena Ridge Observatory 2.4-m telescope, each frame is a 5×60 seconds, 0.48″/px resolution. Many thanks to the kindness of Bill Ryan). 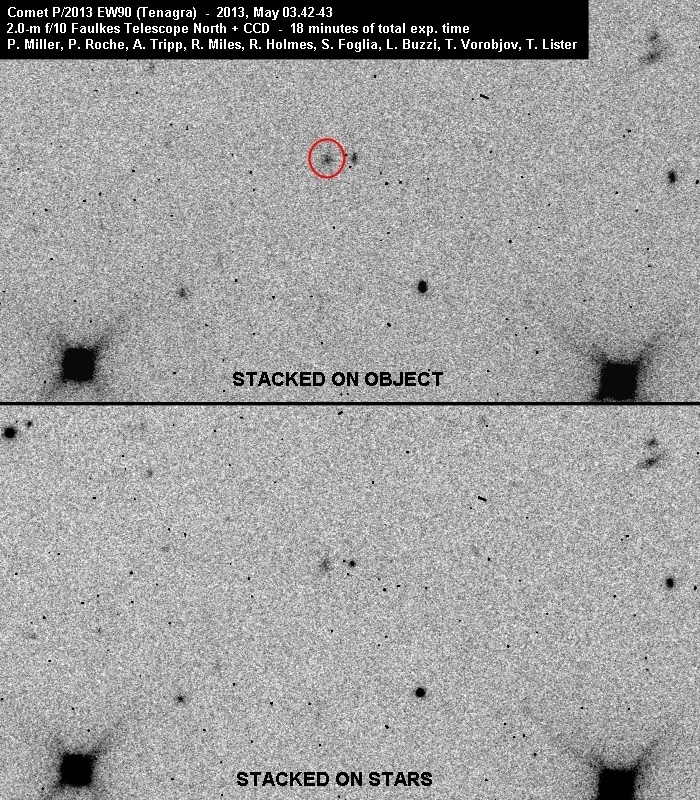 2012 DA14 was discovered on 2012, Feb. 23 by La Sagra Sky Survey in Spain using a 0.45-m f/2.8 telescope, and the discovery was issued on MPEC 2012-D51. Soon it was clear that it would have passed very close to Earth almost exactly one year after the discovery, and so it was. 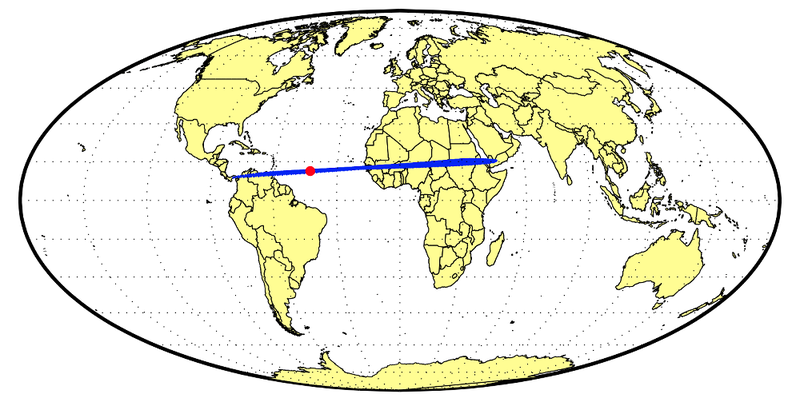 On 2013, Feb. 15 around 19.30 UT it reached perigee at a distance of about 27.700 km from the surface of the Earth (0.09 LD), well inside the belt of geosyncronous satellites but with no risk of collisions given its orbit. The asteroid has an estimated diameter of about 40 meters, and it is currently the biggest asteroid passed so close to the Earth: other objects passed closer, but they were smaller. Despite some clouds interfered with the observations, we were able to catch it at 21.21 UT, when it was in constellation Ursa Major (the Big Dipper) at a distance of 59,000 km and moving at 1084″/min in PA around 6.0°. The 60-sec image, visible below, was taken with a Pentax 75mm refractor f/6.7 and a CCD SBIG ST8-XME (FOV approx 90′ x 60′). The beginning of the trail (bottom) has the following coordinates: RA 12h 31m 25s – DEC +52° 16′ 50″. 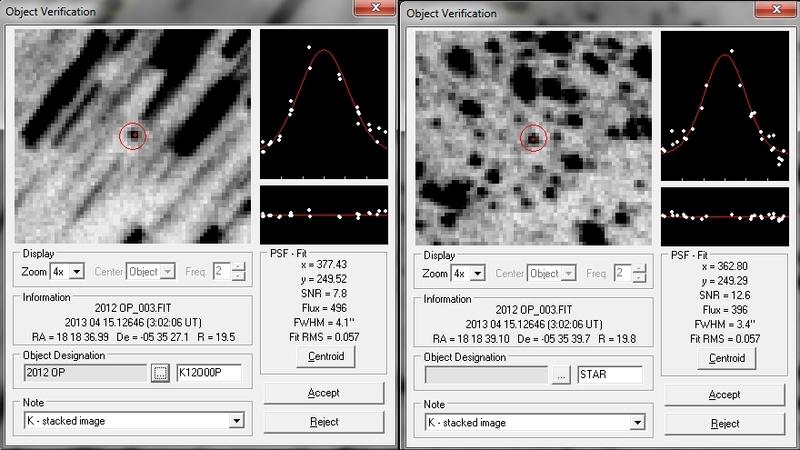 After one hour I also imaged it with a 0.38-m f/6.8 reflector and the same CCD, giving a FOV of (only) 18′ x 12′. 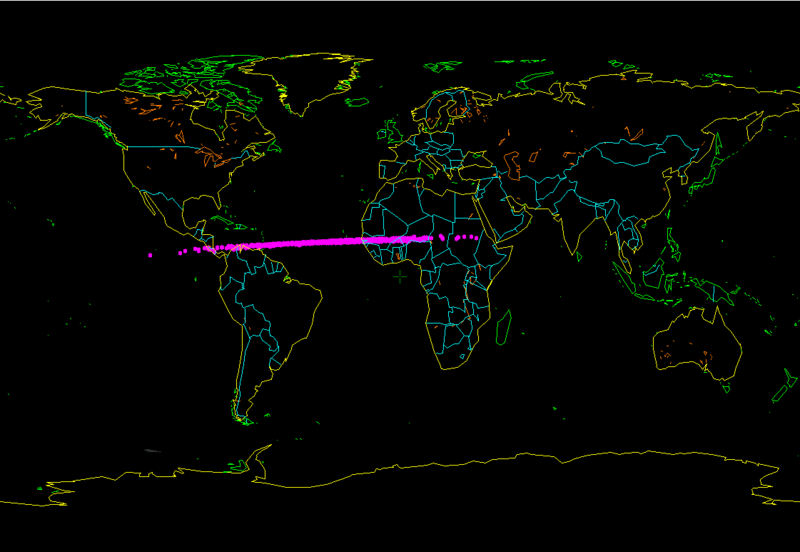 The asteroid had half the speed of the previous image (576″/min). Here the beginning of the trail (bottom) has the following coordinates: RA 12h 44m 31s – DEC +67° 11′ 26″. For a work with a student here at Schiaparelli Observatory I decided to determine the distance of an asteroid by parallax, a good educational experiment. Even with NEOs, it will be good to have the longest possible baseline, so I’ve asked the help of Robert Holmes from ARI Observatory, Illinois, USA (H21). 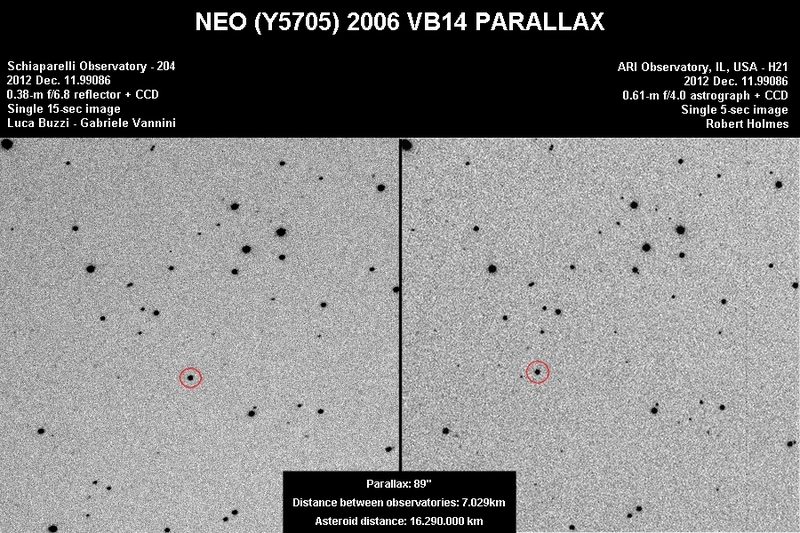 I chose NEO (Y5705) 2006 VB14, bright and of course visible at the same time from both observatories. On 2012, Dec. 11 the sky was clear from both locations so we exposed the field for nearly half an hour with different exposure times to maximize the number of frames with the same exposure time. In the end I found several images taken at the exact second and I started to do the calculation of parallax. 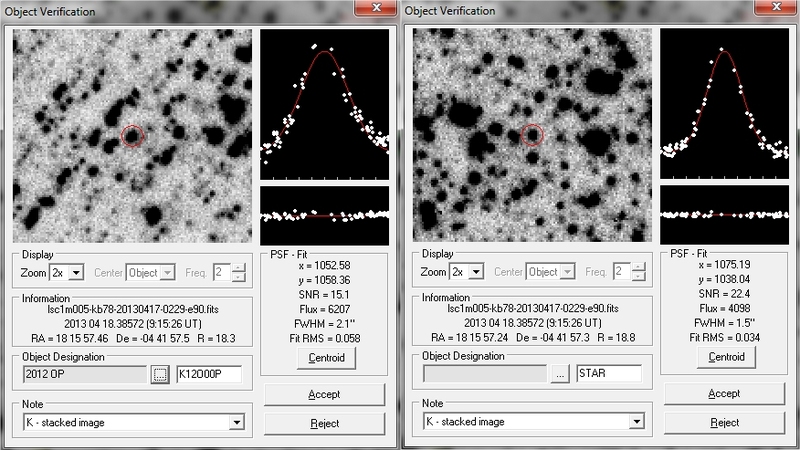 The parallax measured is 89” (+/- 1”). where r is the radius of the Earth and d the angle in degrees. The result is 7,029 km. where p is the parallax in degrees. The final result was 16.290.000 km, in very good agreement (difference of only 0.77%) with the orbital distance (16.165.000 km). 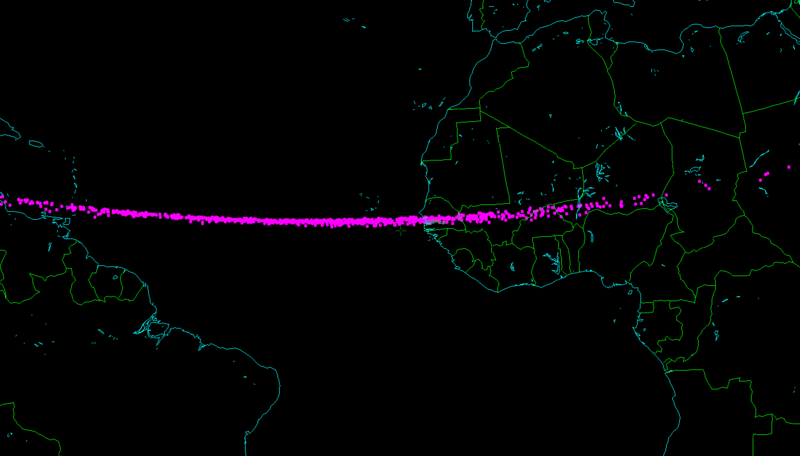 C/2012 X1 (LINEAR) was discovered by the LINEAR survey using a 1.0-m f/2.15 reflector from Socorro, NM, USA, on Dec. 08.38. Their automatic routines do not require human intervention, so it was reported as asteroidal and posted in the NEO Confirmation Pageunder the temporary designation CE63887. I was able to image it the following night with a 0.38-m f/6.8 reflector. Visually (i.e. on the screen) it appeared slightly diffuse respect to stars, and the analysis with the “FWHM method” clearly revealed its nature: profile 30% larger than stars nearby, and a coma 8″ wide. This is again a demonstration of how good is the FWHM method (used largely in our T3 project) in discerning comets among asteroids. Many other observatories detected it, and results were published in CBET 3340 (subscription required) and astrometry, together with preliminary parabolic orbital elements, in MPEC 2012-X70.